With the trailers for the release of the movie 2012, the level of fear and hopelessness for the future is rising daily, mainly through doomsday prophecies concerning the year 2012. However, prophecy was never intended to be viewed as a forgone conclusion. Divine Teachers emphasize that there are several possible futures, which are determined by the choices we make. In a nut shell then, prophecies are given to Humanity by the Divine to awaken us and help us make the best decisions. But how does a world so divided come together and change course? Since we cannot even agree on how to solve problems in our own communities, how then will it be possible for millions of members from different nations and religions to reach a consensus on the solution? It seems impossible yet if that were true it would make the prophecies pointless. Moreover, it would indicate that the Divine Realm does not understand the situation. This conclusion is not only untenable but utterly ridiculous. On the contrary the Divine Realm has given us the means to change our future. Those means are found in the Mysteries spoken of by Jesus and Others. The Mysteries are Ancient Teachings for individual development of higher consciousness and understanding. For those of you unfamiliar with these Mysteries we speak of, let us share how we came to understand their significance at this time. It began in Jerusalem 15 years ago. At the time we were steeped in Judeo-Christian beliefs and our experience in The Holy Sepulcher Church was surreal. Despite being told to be present at the first part of the “Second Coming”, we had no idea what to expect. It was not until many years later that we understood this Energetic Return of the Universal Christ, which is portrayed in the Visual Re-Creation video below. However the most amazing realization was our discovery that Nostradamus’ Lost Manuscript (rediscovered in 1994) appeared to have predicted this event. Furthermore, he may have also predicted The Know Thyself Initiative. Even though it was the first part of the Second Coming of The Universal Christ, it was not immediately shouted from the rooftops because this was not part of the divine plan. First we needed to understand why The Universal Christ chose to return in this way. The answer lay in The Mysteries recorded in Scripture and now presented in The Know Thyself Initiative. The Initiative is designed using The Mysteries and applying them in a practical manner to create a critical mass number of dedicated individuals. These 777,000 are found within every nation, ethnicity, and religion and were born to help transform the World. They become the light of peace and hope transmuting the darkness of strife and fear. One of the first questions that arise is why did Jesus return now? The answer is to awaken 777,000 individuals. The second question is where is he now? The Universal Christ went into the hearts of the Human Race to touch all of Humanity with waves of truth and understanding. This intersection of The Christ Energy Plane with the world energy plane is depicted as the Cross in the video bursting into the many rays of light. This manifested in the works of individuals, such as Eckhart Tolle and Greg Braden. Greg Braden’s The Divine Matrix relates that the consciousness of a critical mass number can affect the consciousness of the planet and Eckhart Tolle’s books teach how those individuals change the way they think. Since 1994, The Christ has also inspired screen writers of movies like The Matrix and T.V. shows that display the power of the human mind. If transformation seems an impossible task let us say that Noetic sciences, a central theme in Dan Brown’s The Lost Symbol, have proven that focused thought affects the structure of matter. Surprisingly, Noetics is an ancient discipline that can be applied globally to heal the planet and was included in The Mysteries. However, at the global level focused thoughts have to coincide with the change of frequency generated by the thoughts of the individuals, which is affected not by what they think, but the way they think. For instance, to reverse Global Warming the individuals need to alter their perspective on the composition of reality. The process involves not only investigation of the origin and purpose for existence, but also what happens to consciousness after death. So the I.D.E.A. Foundation for the Benefit of Humanity is announcing that we are seeking the 777,000 individuals to help us stop the prophecy of doomsday for the year 2012 being fulfilled and implore you to ask yourself if you have been born to help transform the world. We realize this proclamation is difficult to believe, but fortunately you do not have to believe it, just be open to the possibility that it is true. In light of the alternative can any of us take the chance to ignore a solution to the problem? Below is an in-depth explanation correlating the connections between Nostradamus and the above events. After we returned from Jerusalem, we had looked for evidence to confirm what we were told happened at 3:00 pm in the Holy Sepulcher Church in Jerusalem on April 4th 1994. For those of you familiar with our story, you will remember that we were sent to the Church of the Holy Sepulcher in Jerusalem. On that day at 3:00 pm Suzzan lay face down on the floor at the first stage of the crucifixion, her body racked with sobs. What we did not learn until later was that she was experiencing the Christ-Consciousness moving through her heart and into this plane. We learned that this was the first stage of the Second Coming. At the time, we understood the Second Coming from the Judeo-Christian perspective, rather than as an energetic and consciousness event and like most Christians saw the Second Coming as the literal physical return of Jesus. However, we have since discovered that Jesus’ return was as the Universal Christ-Consciousness to awaken us to the Spirit within and begin the transformation of the Planet, by transforming ourselves. Because the experience was so powerful, we had thought the event had to have been prophesized, but could find no prophecy. We had almost given up ever finding an outside reference to our experience on April 4th 1994; that is until we watched a documentary on the History Channel on a Lost Manuscript of Nostradamus. The manuscript consists of 72 drawings or plates, which the Italian author Ottavio Cesare Ramotti has interpreted in his Nostradamus: The Lost Manuscript. In the documentary certain elements in several drawings seemed familiar, especially the last 7 images numbered 66 through 72. The first plate in the series, Plate 66 was the most evocative, however, we did not realize Plate 66’s importance until we read Mr. Ramotti’s book. His book does not cover all of the 7 Plates, but he does focus a great deal on Plate 66. As we read his interpretation and gazed on the Sun over the lion, the more we felt Plate 66 was symbolically depicting what occurred in Jerusalem. This was confirmed with every minute detail of the drawing, which all had a connection to our experience. Before we get to those particulars of Plate 66 and their connection to the Jerusalem event in April 1994, we will list the 7 elements of the plate and Mr. Ramotti’s interpretation of their association. The italicized remarks are our additional connections that we will demonstrate below. First let us relate how we discovered the connection with Jerusalem and Nostradamus’s Plate 66. As stated, the documentary in 2008 on the History Channel had introduced the Lost Manuscript of Nostradamus, consisting of 72 drawings or Plates. 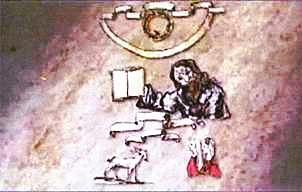 The main focus of the documentary had been to determine if the 72 plates were if not drawn by Nostradamus, then initiated by him. Ultimately, the consensus was that the work originated from Nostradamus, but that the artist was most probably Nostradamus’s son Cesare. The bulk of the documentary concerned the plates as representing the succession of Catholic popes, however the last few minutes concentrated on the last 7 images as relating to the countdown to 2012 and the alignment with the “dark rift” at the center of our galaxy. The first in the series of 7 plates was a large Sun on top of a lion. Concerning Plate number 66, a commentator related that the Sun in the drawing symbolized Astrological Wisdom. In 2009 the History Channel aired another documentary on Nostradamus’s Lost Manuscript, only this time they focused on the last 7 images numbered 66 through 72. The main premise of the documentary concerned the 7 plate’s message of 2012. In this documentary they showed the 7 plates several times and we were struck by the similarity of the images to elements in the Rider-Waite major Arcana. This was what made us want to read Mr. Ramotti’s book to see if there was a connection between the drawings on the 72 plates and the Tarot. As we read Mr. Ramotti’s book and examined the Plates in respect to the Major Arcana we concluded that there is a real possibility Nostradamus deliberately used similar symbols to the symbols in the Major Arcana to conceal a deeper meaning. So with this in mind we set out to examine the image of drawing 66 not only with Mr. Ramotti’s viewpoint, but with the interpretation of the symbolism from The Rabbi’s Tarot. We began with the top of the page and the wheel. This symbol as well as appearing on The Wheel of Fortune, also appears of the robe of card 0 The Fool. The Fool symbolizes the Spiritual Soul beginning its journey through life and the wheels on The Fool’s robe signify the cyclic nature of life. In Plate 35 The Wheel of Destiny, according to Mr. Ramotti represents change. Our understanding of the relevance of drawing 66 took a huge leap when we read Mr. Ramotti’s interpretation of the image. Concerning the Sun he writes “This is the prelude to the light of the Great Sun of the New Millennium and Humanity’s Rebirth.” This immediately reminded us of our experience in Jerusalem April 4th 1994; consequently we wondered if this could be the Astrological event the symbolism of the Sun in the drawing was pointing to. To answer that we needed to closely examine all elements of the drawing. Beneath the Sun lies a lion wearing a Cardinal’s hat. The hat seems so completely out of place that we felt Nostradamus must have meant it to hold great significance, but what? Another weird element is the symbol alongside the star to the right as you look at the picture. Initially we had thought that the symbol represented some form of comet, but after reading Mr. Ramotti’s book we learned that the symbol represented mountains. The date that Plate 66 covers according to Mr. Ramotti is from 1991 to 211; however he does not connect Plate 66 with Pope John Paul II or Pope Benedict XVI, the popes who reigned during this period of time. Instead he associates Plate 66 with the Popes of the 2nd Vatican council, who were John XXIII and Paul VI. Mr. Ramotti associates Pope John, because he wore a Cardinal hat and Pope Paul, because his name was Montini, meaning mountain and whose coat of arms contains mountains. Nonetheless, we felt that the mountains and the Cardinal’s hat the lion is wearing in Plate 66 were directing us to more specific information. They were. Another plate that Ramotti mentions is Plate 7:42. This plate’s drawing also has a large lion; only in this drawing the lion has a raised paw over the outline of an invisible book. Above the lion are the mountains of Pope Paul VI. The question is why did Nostradamus associate Paul VI to Plate 66? Mr. Ramotti associates the reference to Paul VI in Plate 66 as the re-emergence of the Catholic Church after the 2nd Vatican Council. Plate 66 as “The Prelude to the Light of the Great Sun of the New Millennium and Humanity’s Rebirth” obviously concerns a period long after the 2nd Vatican Council. There has to be a deeper reason for Nostradamus associating Paul VI with the New Millennium. We found the deeper meaning in the text concerning Plate 7:42. In the text Mr. Ramotti relates the connection of Pope Paul VI to Plate 8:53, which concerns the Pope Paul’s visit to Golgotha, Israel in 1964. In addition, Mr. Ramotti relates that it was during Pope Paul’s period in office that Cyprus was occupied by Turkey. As for the “Cardinal’s hat” evidently this detail also has a specific reference to Pope Paul VI. According to an article on Wikipedia, the Pope used to place a scarlet galero (a large, broad-brimmed tasseled hat) on the new cardinal's head, crowning them as it were a Prince of the Church. Apparently, then Archbishop Montini (Paul VI) did not receive the traditional red hat of a cardinal from Pius XII's when he became a cardinal. Even more relevant in 1969, Pope Paul VI issued a papal decree following the Second Vatican Council that ended the use of the galero. He did this as an act of humbling the Church hierarchy. Pope Paul’s main mandate was to create union with not only all Christians, but all faiths. We now turn to the other primary feature in Plate 66, namely the lion beneath the Sun. 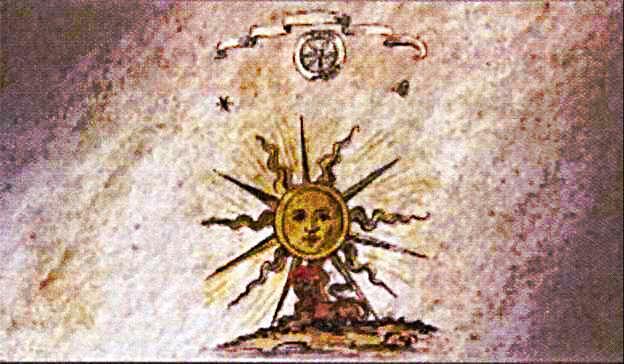 In the first documentary on Nostradamus’s Lost Manuscript, a commentator related that Plate 66 referred to the sun-sign Aquarius, because the lion was the symbol of the sun-sign Leo that was opposite to Aquarius. We had been immediately reminded that the Tarot card assigned to the sun-sign Leo; card 8 Strength prominently features a lion. We would agree with the proposal that Plate 66 points to the Aquarius, because there is another small detail that represents the sun-sign Aquarius. That detail is the small star opposite the symbol of the mountains. The only other time a star appears in the last 7 drawings is in Plate 72, Mr. Ramotti relates that the star in Plate 72 represents, “…our spiritual essence ” that will “…return to the great central Sun.” The six-pointed star represents both the Planet Venus and Jesus The Christ. This is interesting, because card 8 Strength features a Woman, which represents the transformed Empress. Card 4 The Empress whose Hebrew letter Daleth means door represents the Planet Venus, which is associated with Sophia, Isis, and Mary Magdalene. The symbol of the lion in Plate 66 and the allusion to the sun-sign Leo gives us one more clue to identifying the meaning behind the imagery. Leo is ruled by the Sun and both the Sun and Leo represent the heart. The Sun in the drawing appears to be descending into the lion’s body. The main heading of Plate 66 is “The Prelude to the Light of the Great Sun of the New Millennium and Humanity’s Rebirth.” Another interpretation of the “Light of the Great Sun” is the Universal Christ, the true Sun/Son behind the Sun. We have shown the similarity between the suns in Plate 66 and Card 19. Esoterically, the Sun represents Astrological Wisdom and card 19 The Sun represents the Christ-Consciousness. Before we get to the connections of the 7 elements of Plate 66 and what occurred in Jerusalem in 1994, we think it may help if we recap our personal experience of the time before, during and after the day in the Church of the Holy Sepulcher. As the focus was primarily on Suzzan, we will let her relate her experience. The italicized section relates what we have since learned about the event. “My experience in Jerusalem essentially began in Cyprus on Good Friday. At the time we had travelled across the border to the Turkish side of Cyprus and were visiting a Byzantine fort in a small seaside fishing village called Kyrenia. While exploring the fort I suddenly felt unwell and Craig took me outside on the battlements to get some air. As I stood looking out over the sea, a piercing pain in my right side doubled me over. Then suddenly, I saw a vision of Jesus Christ on the cross; it was as if I was literally there. As the piercing pain increased I heard “Let the pain go through you. Let yourself feel it, and don’t be afraid. It will soon pass.”At the time we had no clue as to why I experienced a pain in my right side, until we learned of the legend of Longinus the name of the centurion that pierced Jesus in the right side on the cross. It concerned the connection between Jesus Christ being the “Pierced One” and Chiron the Centaur, who was also known as the “Pierced One”. This would not really come to light until we had an astrologer compile a chart for Jerusalem at 3:00 pm April 4th 1994. Before we went to Jerusalem our tour visited the Church of the Nativity in Bethlehem. In the church we had made our way to the traditional site which marks the spot where Jesus was born. The exact spot is marked by a Silver Star, which people touch with rosaries and crucifixes to be blessed. I had two rosaries I had bought for friends in Saudi with me to be blessed. As I knelt down and touched the Star, I was surprised by the lack of emotion. The small room seemed empty and after touching the Star, I had stood watching people go through the ritual of blessing crosses and rosaries in a kind-of numb daze. It wasn’t until a man threw himself into the opening on the floor over the Star and lay there praying that I felt anything. I was mesmerized by the man. He looked so frail; he was obviously having a deeply spiritual experience. After the man struggled to his feet, I was compelled to walk over to him and place my hand on his shoulder. To my utter surprise, I said the words “Be blessed.” Amazingly the man looked over his shoulder at me, smiled and kissed my hand. Seconds later the man went back upstairs, as if nothing had happened. We followed him and learned that he was Italian and hardly spoke any English. The whole encounter was bizarre and I left the Church thoroughly perplexed by the whole episode. I was still thinking about the incident in Bethlehem on the coach when I glimpsed the magnificent city of Jerusalem for the first time. As I gazed in awe at the city I heard “Today is the unification of all faiths” I didn’t really understand that until many years later when our studies led to discovery that beneath all religions is a common theme called the Wisdom Religion. As we wrote in My Lost Love we had almost missed our “appointment” at Golgotha, because Craig and I had been in kind-of daze earlier and had not registered that the Church of the Holy Sepulcher was built over Golgotha. Nonetheless, the force driving me to be there was so strong I do not think wild horses could have prevented me from going back. It is important to state that although Craig was supposed to accompany me and did, I would have gone with or without him. It did not matter that I would have been stranded in Israel, all I could think was I had to get to Golgotha by 3:00 pm. Anyone who has experienced a Spiritual calling will relate to that overwhelming compelling to be somewhere. “Luckily” we were guided back to the church by a Muslim Palestinian, which in itself was pretty incredible. When we reached the entrance, I only had seconds to decide which way to go. Again I was driven up the stairs to my right and stopped in front of a huge mural of Jesus being nailed to the cross with Mary Magdalene lying prostrate across his feet. I guess, because I had the vision/memory of being at the foot of the cross in Jeddah, it seemed the appropriate place to be, but again I was not thinking this through, I was acting purely instinctively. That may surprise some of you, because we think of the instincts as a lower consciousness, but I was being guided from within and at the time to me that was instinctively. Standing in front of the mural in this huge ornate church, I was confused. In Jeddah when I first had visions of going to Jerusalem, I had seen Golgotha as a green hill. In my vision Jesus Craig and I were kneeling in front of Jesus, who had placed his hands on our heads and said “Be together in my name and in the name of Love.” What was in front of me that day did not make any sense. Totally unsure what to do, I felt the overwhelming need to fall to my knees and surrender my will to God and say, “Father I submit to thee, take me to do thy Will.” I honestly do not know where the words I said came from, I just opened my mouth and out they came. After a while I was vaguely aware of Craig trying to move me and saying, “Shouldn’t you be at the next stage, praying?” The second stage was the actual crucifixion. I did not have a clue where I was, let alone where I was supposed to be. It was all I could do to focus, because an incredible energy held me rooted to the spot. It had started in my fingers and then spread through my entire body. As the strength of the energy increased, I found it very difficult to breathe. Craig noticed my breathing was rapid and deep and pushed me down until I was sitting on my heels. Although my eyes were closed, I saw Jesus Christ standing in front of me with hands outstretched toward me. At that moment I felt a very strong pulling sensation concentrate in my chest. So powerful was the force that it propelled me forward at the same time thrusting my arms out from my body. The strange thing was that it was a totally involuntary movement; luckily Craig reacted quickly and was able to lessen the force of the blow, as my head struck his hand instead of the hard surface. Though totally conscious the entire time, I was unable to speak or move. Aware that Craig was holding me a deep sadness engulfed me. It literally felt like I had the sorrow of the World within me, which made me start sobbing, my body convulsing with emotion. The strength of emotion had surprised me until we learned that the Astral Plane is also known as the Emotional Plane. As I was acting as a door into this plane for a few minutes I was open to the Emotional Plane and experienced intense emotions. After a while, the debilitating emotion of sadness was replaced with a beautiful feeling of perfect love. As I slowly became more aware of my surroundings and tried to understand what had happened, I looked around the church. To my astonishment on my left was the Italian man we had met in Bethlehem. He was kneeling in prayer at the next station; the actual cross of the crucifixion. By then the energy had left my chest and was concentrated in my hands again. Craig was looking anxiously at his watch, which read 3:10. At that moment the church bells rang out and Craig attempted to raise me to my feet. Instead of moving, I said, “Bring the man over to me.” Following the direction of my glance, much to his surprise, Craig recognized the man. The man seemed quite comfortable to be led back to me. Once again unsure of what I was doing or why, when the man knelt by my side, I placed my left hand on the top of his head. Almost in a daze, the man took hold of my right hand and held it to his chest. To any onlooker, it would appear that we both knew exactly what we were doing, which for my part was the furthest thing from the truth. I was being moved by forces more powerful than I. Then the beginning of Psalm Twenty-Three “The Lord is my shepherd, I shall not want” popped into my head and I felt compelled to recite the psalm. I did not remember all the words, but I guess I must have said the relevant part, because afterwards the man smiled and allowed Craig to lead him back to his former position praying before the cross. The whole experience had seemed so bizarre that in some way I thought I had imagined it, but over the years we came to understand that the Italian man carried the Consciousness that had resided in King David and had travelled to Jerusalem that spring because he was dying of an incurable disease. Evidently, the energy that facilitated the opening for the Universal Christ to re-enter this plane was used to help the man. Just before we left Cyprus for the United States, we were told to return to Kyrenia on the 26th of June. We drove to Nicosia and arrived at the border at 1:30. To our surprise, the border guard told us, “You are too late to cross today. Come back tomorrow.” Craig pleaded, explaining to the guard that it was imperative we cross that day and that tomorrow would be too late. With a puzzled look, the guard asked, “Why?” It was then I heard the words, “Tell him the reason.” Amazingly, after hearing the reason why we needed to cross, the guard reluctantly gave his permission, but stipulated we must return by 5:30. As stated, on Good Friday in Kyrenia, Cyprus Suzzan had experienced a piercing pain in her right side. It was related that we learned that the experience concerned both Jesus and Chiron being referred to as the “Pierced one.” We also said that we didn’t understand the true relevance until after we had an astrologer compile a chart for 3:00 pm April 4th 1994 in Jerusalem. After connecting Plate 66 to an Astrological event, we had wondered if the Astrological event depicted in Plate 66 was one and the same event we experienced in 1994. 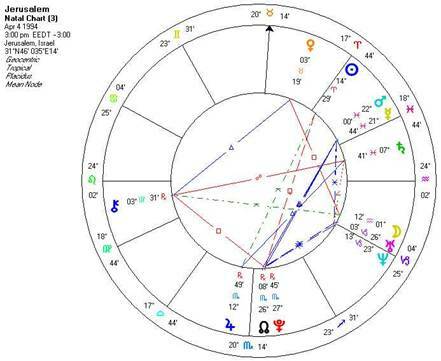 After reviewing the chart again, we believe the chart for our experience in Jerusalem reveals it is the Astrological event symbolized in Plate 66, but do not take our word for it, examine the chart yourself. In case you have forgotten what the Astrological symbols mean, we will repeat the Chiron symbol— . As you can observe all the energy is focused on the symbol of Chiron, which is in the 1st house that represents the physical body. Suzzan’s “heart/body” was being used as a doorway to connect all the planes. Moreover, Suzzan’s birth sign is Leo and the Ascendant of the chart is Leo. This became clearer when we investigated Chiron. As stated, the first thing is that both Jesus and Chiron were referred to as the “pierced one”. In Section 7-c of the Know Thyself Initiative we discussed the relevance of Chiron to Spiritual Evolution. To recap: “Some astrologers want to place Chiron as the ruler of Sagittarius. Many believe this is because Sagittarius’s symbol the archer or centaur perfectly represents Chiron, the centaur. Why would astrologers give the sun-sign ruled by Jupiter the king of the gods the symbol of a centaur? The reason is the ancients wanted to say that the true king of the gods was the centaur. Obviously, this did not have any validity until the discovery of Chiron in 1977. While some astrologers want to make Chiron the ruler of Sagittarius, others want to make Chiron the ruler of Virgo. Then my prophesy is mined and done. I see in Her most sacred hand the web of the divine plan which in the Moon is already known and revealed so that people might better know union…The weight of the predator wolves will last until late, when the senseless people will be reawakened by Jesus from their illusions. The Moon, greatest of authors, directs the rhymes of the prophecies that arrive here from Her. If those that we help have the beautiful and exemplary Moon, at this moment ever more regions are crossing the illumined bridge that heals…And I have a true key which is even more important to pass down… But as soon as the Moon balances the weights, the Sun will open ever more His door…wheresoever esoteric philosophy, which is the seed of the Sun, has penetrated, I shall know different times. Even if the sign of the opening of the door comes late, local territories will open. If the memories of war are exorcised and if violence is diminished. For as soon as you let go your sorrows, you will hear far different solar verse from our Lady. If we use The Rabbi’s Tarot on the passage, it reveals an even deeper meaning. The key is in the understanding that the symbols represent certain Tarot cards. If the words are capitalized then there is a Macrocosmic interpretation. To help you understand we will list the relevant words from the decryption with The Rabbi’s Tarot interpretation. Wolves allude to card 18 The Moon and illusion. The Sun represents card 19 The Sun, which is both the Universal and individual Christ-Consciousness. Door represents Daleth the Hebrew letter for card 3 The Empress or Venus, which is affiliated to Mary Magdalene. As you probably noticed there were other words in the decryption, which also appear to carry a deeper meaning. The first sentence contains the words “…web of divine plan…” which immediately calls to mind the internet. Nonetheless, there are 2 more elements in the decryption that have a far greater meaning than the general meaning. They are “true key” and “illumined bridge”. You may have noticed that the symbol for Chiron is reminiscent of a key— and Chiron is known according to Barbara Hand Clow as the rainbow bridge between the inner and outer Planets. This is because Chiron’s orbit is between Saturn and Uranus, the last visible Planet and the first invisible Planet of our Solar system. Another term for Chiron is doorway. Ms. Clow writes concerning Chiron, “Chiron rules the focal point in time and place of multidimensional consciousness on the physical plane, the ultimate trigger of compassion on the emotional plane, the exact point of insight on the mental plane and the maximized point of mysticism on the soul plane.” In other words Chiron is the key to the door that opened 3:00 pm April 4th 1994 in Jerusalem. Now we come to demonstrating that the 7 elements of Plate 66 are connected to our mission. The first and second elements, the Scroll and wheel refer to our mission particularly the Know Thyself Initiative and the information on the Ancient Wisdom For Now Scroll. 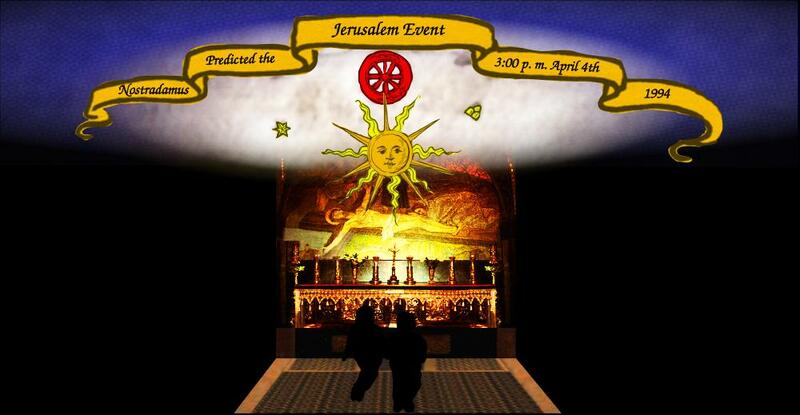 The remaining five elements of Plate 66 are symbolizing the event in Jerusalem at 3:00 pm April 4th 1994. First in case you have forgotten let us repeat what we said earlier. Both the Scroll and the wheel at the top of the page are reflecting the result of the experience in 1994. Dealing with the scroll first, represents how acting as a door facilitated Suzzan’s access to the universal wisdom, which is shared in the documents on the Ancient Wisdom For Now Scroll. The scrolls at the top of each plate represent the flow of consciousness, which is too involved for us to attempt to explain it here. 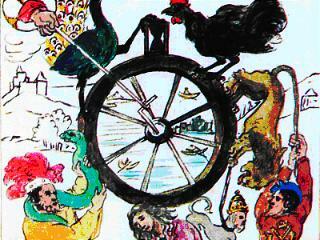 As stated, the wheel as well as appearing in card 10 The Wheel of Fortune, also appears of the robe of card 0 The Fool. Looking at the “wreath” in Plate 72, we were reminded of the wreath in card 21 The World. It is interesting that Mr. Ramotti associates this drawing with “the cycle of return from another dimension”, because Daphna Moore says that card 21 represents the 5th Dimension of which Humanity is destined to evolve to. At their feet as on the Heavenly throne. Can there be a better way to describe the Initiative, whose goal is to help you all re-access the universal knowledge through Deductive Reasoning? The next symbol is the small Star. As stated the six-pointed star is connected to both Jesus and Venus. Venus is associated with Sophia and Mary Magdalene. Suzzan was told she was carrying the Consciousness that was in Mary Magdalene. Card 17 The Star represents the sun-sign Aquarius, which is alluding to the event in Jerusalem taking place in or near the Age of Aquarius. The star also represents the individual Spirit, which Jesus The Christ has been awakening since 1994. 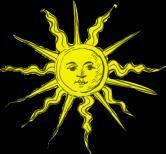 The Sun symbol has multiple meanings. First as stated it represents the Universal and individual Christ-Consciousness. It also represents the Birth of the light and in the Pistis Sophia; Mary Magdalene was referred to as the “inheritress of the light”. Finally the large human-faced Sun descending into the Lion is depicting that the Sun-Christ is entering the physical plane, which is referred to as the Second Coming. Like the Sun the Lion has multiple interpretations. Dealing with the most obvious the Lion represents the sun-sign Leo, which is the Ascendant of the chart for the Jerusalem event. Coincidentally, Suzzan was born under the sun-sign of Leo that begins on July 22nd; the feast day of Saint Mary Magdalene. The allusion to Leo also connects the event to card 8 Strength that represents the Transformed Empress, with the lion in the card representing emotions, there is no disputing the experience in Jerusalem was an extremely emotional event. Again The Empress or Venus in the card is associated with Mary Magdalene. The Lion and the Sun represent the heart, which the Sun-Christ entered this plane through Suzzan’s heart. The Lion also alludes to the Lion of Judah, because the Italian man carried the Consciousness of King David. Finally, Suzzan is English and the symbol for England is the Lion. The remaining 2 elements of Plate 66 The Red Cardinal’s hat and the Mountains as stated are alluding to Pope Paul VI. This to us is the most telling information. Why would Nostradamus connect an Astrological event of the New Millennium with a pope that died 16 years earlier? The obvious answer was that his name would describe one of the participants. The most obvious to us was that Craig carries the Consciousness of Saint Paul. Nonetheless, we think the plate alludes to Paul VI because Paul travelled to Golgotha and during his term in office Cyprus became separated. For us to travel to Kyrenia, which prepared us for Jerusalem, we had to cross the border at Nicosia, which was created after Cyprus was separated. Another obscure reason for associating Pope Paul VI with the event in Jerusalem is that it was during his term that Chiron was discovered. The final reason for associating Pope Paul is because Paul VI was dedicated to the unification of not only all Christians, but all faiths. This is the epitome of our mission; to unite all opposites. Some of you may think that we have manipulated the information to fit our story, but the truth is we could not find any way to discredit our assessment. Even the number of the plate confirms our interpretation. The number 66 reduces to 3 through 12, 6+6=12 = 1+2=3. Card 12 The Hanged Man is an Archetype for The Christ representing sacrifice and surrender and card 3 The Empress as we have said is an Archetype for and Venus or Sophia. Astrologically the number of the Plate also confirms our assessment. 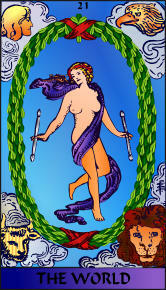 The Hanged Man (12) represents the Element Water or Emotion and the Planet Neptune. Neptune is the higher octave of Venus (3-Empress), which represents the element Earth. Archetypally this can be read as The Christ moved through the Astral /Emotional Plane, Water through the heart of Venus into the Physical Plane. We had struggled with the question of “How a human body could be used as a doorway?” This brings us the 2nd event/experience that gave us greater insight. In 2000, we were sent to Palenque, Mexico. We were told that our mission was for Suzzan to act as a seal between the Astral Plane and this plane. Suzzan had found the whole concept slightly ridiculous. How can a person possibly act as a seal between planes? However, a year after we returned from Mexico, we were shown exactly how in an analogy. That analogy was in an episode of Buffy the Vampire Slayer. The plot has a sect of mystical monks transforming a “key” of energy that can unlock all the doors between the planes and hence release chaos into the universe into a teenage girl. Obviously, if this key falls into the wrong hands; such as an “evil” god then all would be lost. To hide the “key” the teenage girl is inserted into the life of Buffy “the slayer” as her younger sister Dawn. All memories of what the young girl really was and how she got there are completely erased. Both, Buffy and her mother, believe Dawn is a normal teenage girl. Eventually Buffy finds out that Dawn is the “key” to a god being able to release chaos into the universe, so Buffy and her friends struggle with the task of hiding Dawn to keep her safe. To Buffy she is her sister and not just pure energy that will unleash a kind of Armageddon on the world. This is how we view our roles in Jerusalem. Suzzan’s physical body was used to facilitate the Universal Christ-Consciousness’s re-entrance into this plane. He used the “key” Chiron to open the door of Suzzan's heart. We see it this way: in Kyrenia, Cyprus Suzzan was energetically prepared for Jerusalem. Her body was tuned to specific frequency, which could be used on that day. Her anointing afterwards in Kyrenia, we see as a further tuning, so to speak so that her body/heart could be used as a kind-of activator in our other missions. In this way Palenque, Teotihuacan, Machu Picchu, Tiahuanaco, and Rennes-Le-Châteaux were sites that were used to energetically connect what began in Jerusalem. Guy Juarez wrote “Like a thief in the night” to reflect the Microcosmic expression of the Jerusalem event. The Microcosm is the physical level of the axiom As Above, So Below; As Below, So Above. The greatest symbol that defines this axiom is the six-pointed star, which represents the union of Spirit and Matter. The Triangle pointing upwards in the star signifies the physical reaching for the spiritual; in this song the Below or Microcosm is represented by the personal Christ returning to help us find the individual Christ-consciousness, or the Kingdom of God within. Guy wrote “Prelude to the Light of the Great Sun” to reflect the Macrocosmic expression of the Jerusalem event of April 4th 1994. The Macrocosm is the Spiritual level of the axiom As Above, So Below; As Below, So Above. The Triangle pointing downwards in the star signifies the Spiritual - Plane descending into the physical; in this song the Above or Macrocosm is represented by the Universal Christ returning to the Physical Plane with the Light (Sun) of Truth.